It's no secret that perhaps one of the most fun things about having a daughter is getting to dress her up in pretty dresses! During these summer months, my daughter's wardrobe has primarily consisted of them- easy and pretty. I particularly love dressing her for the special occasions- holidays, weddings and of course her birthday! This year for her very first birthday I wanted something very special for my girl. Something that reflected her and showed off her natural beauty- so I went to Etsy to search. What I found there was Kings Daughters. Kings Daughters is a children's boutique featuring fun items for special occasions like ruffle pants, embroidered tops and my personal favorite- pillowcase dresses. 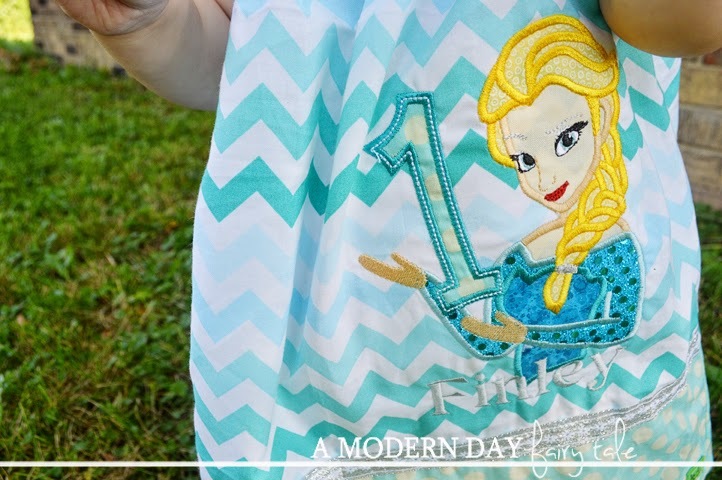 For this review, I received a personalized Frozen inspired pillowcase dress. First of all, how absolutely gorgeous is this? 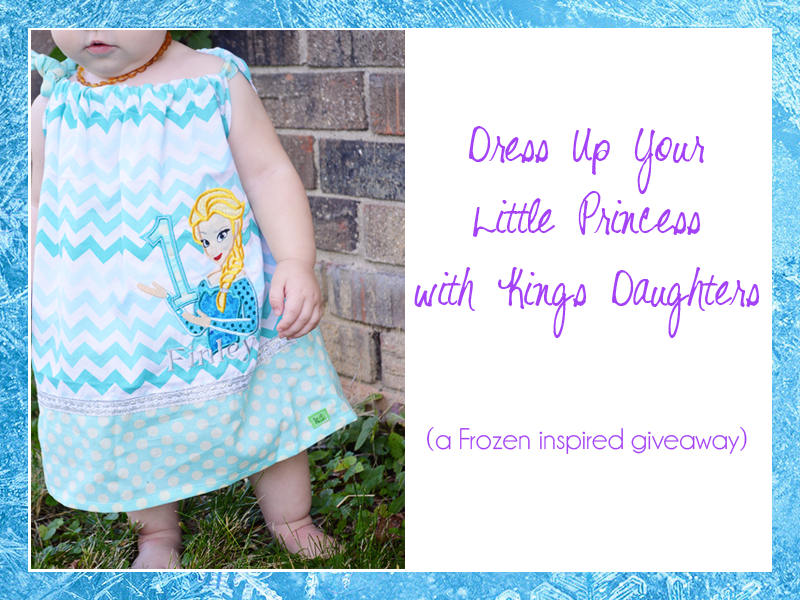 The colors were perfect, the design adorable...absolutely perfect for my Frozen obsessed princess! Personally, I love pillowcase dresses for a couple of reasons. First of all, they are incredibly simple- they're not over the top fancy, but truly allow a child's natural beauty to shine through, simply complimenting that beauty. Gorgeous. I'm also a bit hesitant to purchase clothing online due to sizing, but I think these dresses seem to have a lot of give in their size. 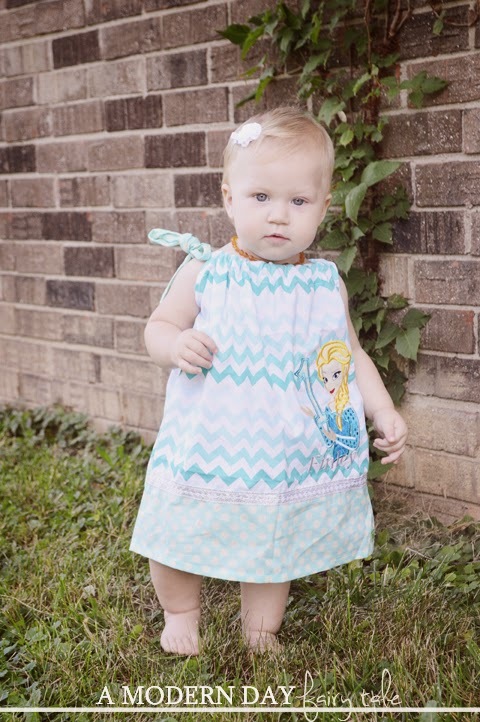 The 18 month dress we received fit wonderfully now, but could have fit just as well were she a little bigger or even smaller, so it's certainly a good option if your daughter is between sizes (or if you're ordering in advance and guessing at size!). The dress was beautifully made with great quality. I personally loved how the various fabrics and patterns coordinated so wonderfully...giving it great visual appeal without being over the top. My daughter loved that it featured her favorite character...she kept bending down to get a better look...adorable!! And it looked beautiful on her as well!! It truly was the ideal birthday dress for my little Princess. And one very lucky reader is going to win a dress for THEIR little princess too! Enter using the Rafflecopter form below. The hometown heart dress - I would totally get that one! I also love the Yellow and black chevron steering wheel cover! My favorite item is the patriotic girl's pillowcase dress. I love the Monogram chevron infinity scarf. I like the yellow and black chevron/ polka dot steering wheel cover. I love the Frozen birthday outfit! So much cute stuff!